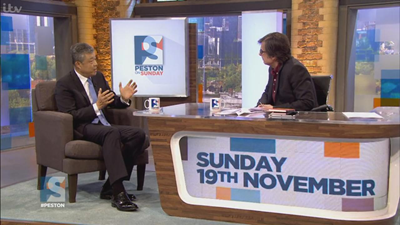 On 19 November 2017, Ambassador Liu Xiaoming gave a live interview on ITV's Peston on Sunday, in which he shared his views on the 19th National Congress of the Communist Party of China. 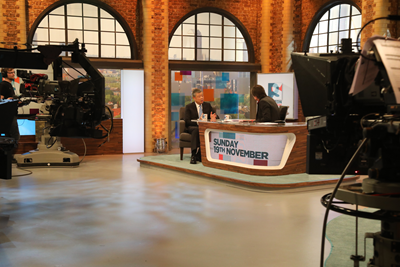 He also answered questions about the North Korea and the latest developments in Zimbabwe. Peston:Very nice to see you, Mr. Ambassador. You are just back from that incredibly important Congress in Beijing. Is it right--it was widely reported as establishing President Xi as perhaps the most powerful leader China has had since Mao--is that right? Is he now the most powerful Chinese leader since Mao? Ambassador Liu: I would say, he has been re-elected as the General Secretary of the Party and he will lead the country into a new era of building socialism with Chinese characteristics. Peston: You use the phrase, socialism with Chinese characteristics? One of the things that is very striking about China, as it is in this country, is that there is a big gap between rich and poor in China. Is that acceptable in a socialist country? 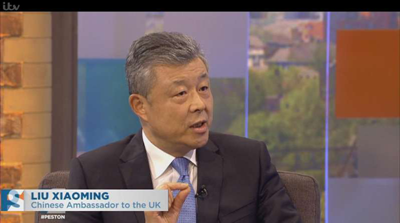 Ambassador Liu: There is a gap, I wouldn't say big gap, if you compare China today, the gap between rich and poor, with some other developing countries. Peston: A lot of billionaires? Ambassador Liu: That is exactly what the Party Congress is trying to address. We realize there is unbalanced and inadequate development in China. A lot has to be done to address the ever-growing needs of the people for a better life. That includes, as the President said during the Congress, we will do everything possible to address this gap between poor and rich. We will do everything we can to elevate the poor population. In China right now there are still 40 million. In the past 30 years we had elevated 700 million people out of poverty. Peston: That's a remarkable achievement. Ambassador Liu: The target for the Party and the government is to get those 40 million people out of poverty by the year 2020. That means we will wipe out poverty, according to the poverty line in China, when we successfully build a moderately prosperous society in China. Ambassador Liu: For three and half years. Peston: In the West, there's concern that China isn't putting enough pressure on North Korea to abandon its nuclear tests. What do you say to that? Ambassador Liu: That's not true. As a matter of fact, China has done everything we can. First of all, we tried to dissuade North Korea from developing their nuclear weapon programme. When I was Ambassador to North Korea, I did my best to convince them that it would not be in their interest to develop nuclear weapons. Peston: Why have they gone ahead? Peston: Shouldn't there be tougher sanctions? Many say China should impose tougher sanctions. 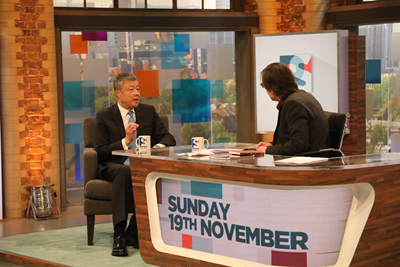 Ambassador Liu: We have voted all along since 2006, when I was the Ambassador. You know, since then, there have been 16 UN sanction resolutions on North Korea. China voted along and China strictly abided by the resolutions and implemented our obligation. The important thing you have to realize is you can't impose sanctions for sanctions' sake. Sanction is a means but not the purpose. The purpose is to get North Korea to stop their nuclear weapons. So you need to engage them. So the UN resolution is not only about sanctions. Peston: Are you pessimistic about North Korea at the moment? Ambassador Liu: No, I am still cautiously optimistic. I still believe that if all parties could engage each other and we encourage North Korea to return to the negotiation table, we can still find diplomatic solution to this crisis. Peston: Can I ask one other question about the international picture? China has big economic interests in Zimbabwe. Is China pleased with seeing the end of Mugabe? Peston: Can I press you on that, because there are widespread reports the army would not have taken the action against Mugabe without the support of China? Ambassador Liu: No, that's not true. We never interfere into their internal affairs. This is up to them, the Zimbabwe people, with regard to what to do with their future of their country. We certainly hope that things will be resolved peacefully. Peston: Very nice to see you again, Mr. Ambassador. As always it is a great pleasure talking to you!